I have a ponytail palm that stays in the house facing a huge west window that has solar screens on it. Due to the heat here, we had to put the screens on the windows. The plant seems healthy except that the leaves have turned brown half the way down. I have clipped the brown tips but the browning keeps accuring. I water as directed so don't know what is happening. All of my other plants in the same area are doing fine. Please advise. Thanks. 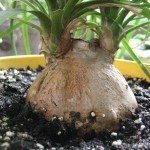 Pony Tail Palms should be on the dry side, only watering when the soil has dried out. If your over fertilizing this will also cause the fronds to turn brown. Another reason can be the build up of salts in the soil from watering with softened or conditioned water. If possible use rain or distilled water, or letting the water sit 24 hours ahead of time can help. If the soil is heavily contaminated with salts you can rinse out the soil, but replacing it with fresh soil may be the best choice.